Arthur lived with his parents at No. 3 Gordon Place, Alma Road, Boveney Newtown and was their eldest son. There was no apparent relationship to Harry Bunce, the local farmer and councillor, who lived on the Eton Wick Road. One Bunce family did move from Boveney Newtown to Somerville Road, Eton, in the 1920s, and perhaps these were related to Arthur. He was born in Slough around 1896, moved to Eton Wick and when the war came he enlisted at Reading. At the time he joined the army he was No. 3029 in the Berkshire Yeomanry, but sometime later he transferred to the 3rd Battalion of the Worcestershire Regiment. The reason for this is not clear, but it was by no means uncommon, particularly when troops left their unit to recover from wounds or sickness. Another reason for his move might be the change of roles for the Berkshire Yeomanry Battalions. The 1st Battalion after service in Gallipoli in 1915 the 2nd Mounted Division, saw the Division broken up into independent Brigades and some became the C Battalion of the Machine Gun Corps, while the 2nd/1st Berkshire Yeomanry became a cyclist unit. But by 1917 3rd Worcesters as a Battalion with the 25th Division, were in the Ypres war zone. It was June and for months British tunnellers had been toiling underground to place one million pounds of explosive at 21 separate points under the German held positions. The enemy was in a commanding position on high ground between Messines and Wytschaete, above St. Eloi, a village south of Ypres. At 03.10 in the morning of June 7th 1917, nineteen of the 21 huge mines were detonated. Two failed to explode. The earth shook as the awe-inspiring spectacle occurred and nine Divisions rushed the enemy positions while the Germans were still in a state of shock. From left to right of the British line were three Divisions of the X Corps, then three from the IX Corps, and finally on the right, the Anzac corps comprising of the Australian 32nd Division together with the New Zealanders. The 25th Division, which included the 3rd Battalion of the Worcestershire Regiment, were in the attack with the Anzac troops against the Messines Ridge, and it was here, following those great earth rendering explosions, that Arthur Bunce gave his life. The taking of the Messines Ridge was considered very necessary for the forthcoming Third Battle of Ypres (Passchendaele) that was to be launched on July 31st. Bunce A. Eldest son of Mr & Mrs C. Bunce of 3, Gordon Place, Boveney Newtown, Eton Wick, Private in the Worcestershire Regiment Killed in Action June 7th 1917 age 21 years. 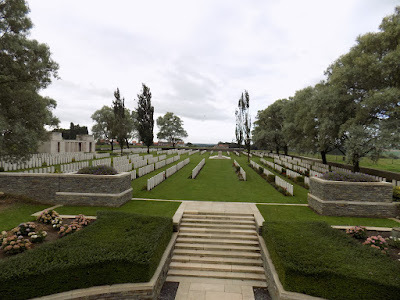 Arthur was buried in the Messines Ridge British Cemetery, Messines, Belgium Plot 2, Row F. Grave 19. The cemetery is six miles south of Ypres. It was created after the war from isolated graves and small burial sites, and at that time recorded 990 UK graves, 338 Australian, 125 New Zealand, 60 South African and 13 other memorials. A memorial to New Zealanders, missing with no known graves, is also in the cemetery. Arthur Bunce was single and 21 years old. He is commemorated on the Eton Wick Memorial, and on the Parish Memorial tablets at the Eton Church gates. Arthur Bunce: The Commonwealth War Graves Commission page. Arthur Bunce: The For King & Country page. Arthur Bunce; Lives of the First World War website at this time.